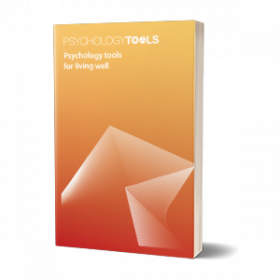 This is an extract from Psychology Tools for Living Well. If you want to learn more about the role of thoughts in cognitive behavioral therapy (CBT) then this is a great place to start. Cognitive behavioral therapy (CBT) is a popular and effective form of psychological treatment. The key message of CBT is that the way we think (our cognitions) and what we do (our behavior) affects the way we feel. It follows that if we want to change the way we feel then we will need to make changes to the way we think and act. In this chapter we are going to explore the role of our thoughts. Figure 3.1: The basic message of CBT: what you think and do affects the way you feel. We have minds that are very ready to notice cause and effect. There are examples all around us: if we let go of an object it will fall to the floor; if we press a switch a light comes on; if we pour water on something then it becomes wet. If you watch very young children exploring their world you can see them learning about the effects of their actions. By the time we’re a bit older the rule of cause and effect has become so natural to us that it just feels like common sense. Figure 3.2: The rules of cause and effect describe the physical world around us very well. Figure 3.3: Our ‘common sense’ way of thinking about the world applied to our emotions. That example might seem OK on the surface, but it can’t be how the world really works. If events always led directly to feelings then everybody would be affected in the same way by an event – we would all like the same movies and dislike the same foods. This is obviously not the case: when a football team wins a match only one set of fans is happy, and if you asked a group of people to sing in front of an audience some would feel excited whereas others would be horrified. Clearly things are not as straightforward as they seem. 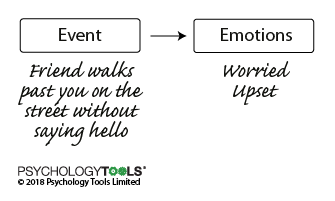 Figure 3.4: How we interpret events determines how we feel about them. The first interpretation personalises the events (“What have I done wrong?”) and results in feelings of anxiety. The second interpretation understands the friend’s behaviour in more neutral terms and leads to a different outcome. Figure 3.5: Another example of how interpreting events determines how we feel about them. The first interpretation here is an excited one – the offer of a promotion is viewed as a welcome opportunity. The second interpretation is less positive – the person offered a promotion is making a catastrophic prediction about what is likely to hap- pen and the result is anxiety. Men are disturbed, not by things, but by the principles and notions which they form concerning things. It may not be a new idea, but it is a powerful one. It explains why some people are pleased when given the opportunity to sing in front of a crowd (“At last, my talent will be recognized!”) when other people would be terrified at the prospect (“I will make a fool of myself and everyone will laugh at me!”). It can explain why some people often feel very anxious (perhaps they have a habit of interpreting situations as threatening) or very sad (perhaps they have a habit of interpreting situations very negatively). Why is our thinking biased? We all have ‘models’ in our minds of how the world works. Our models are a unique result of our history, experiences, and beliefs. The models are a sort of ‘mental short- cut’: one advantage of having them is that they enable us to go about our lives with- out having to think in detail about everything that happens to us. Anna grew up in a household where her parents were not very considerate of one another, and where disagreements were solved by arguments and shouting. As an adult Anna’s model of how relationships work included the idea that “other people are selfish and inconsiderate” and she would assume that this was how other people also thought relationships should work. She held the assumptions “People are always selfish” and “I’ve got to stand up for myself or other people will walk all over me”. A famous psychologist called Christine Padesky talked about models as being like prejudices . She would ask “Have you ever met a racist?” and argue “They ignore some evidence, focus on what they want to see, and twist the facts to fit their pre-prepared story”. We will consider our personal biases in more detail in a later chapter. For now it is enough to know that our models act like ‘lenses’ through which we see the world and which ‘color’ our perception. Emma was often criticized and told off as a child, and her sister was their parent’s favourite. As an adult she lives with the belief that she is not good enough, despite being a loving mother and conscientious employee. She is quick to spot her flaws and mistakes, and assumes others do too. She often puts herself down thinking “it is better to get there first before someone else does”. Emma has blind spots for her achievements and positive qualities. She is so focused on potential failure that she can not celebrate her successes. She finds it hard to feel happy for long – and her default state is to feel anxious. How is our thinking biased? Psychologists have identified common ways that our thinking can become biased. Take a look at the list on the next page and see how many you recognise in your own thinking. 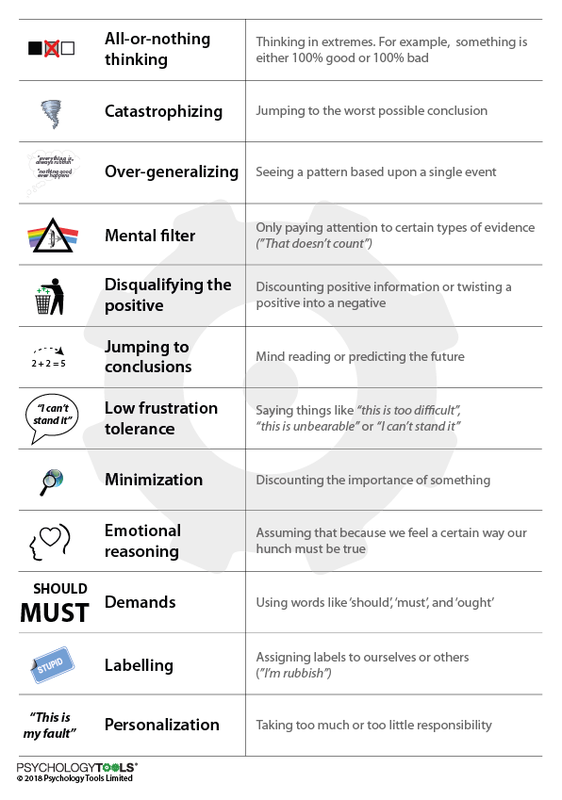 Figure 3.6: Common ‘unhelpful thinking styles’. The idea that our interpretations affect our feelings has important consequences. It means that that there is always another way of looking at any situation, even if it is not immediately apparent to us. If there is always another way of looking at a situation that means that we have choices about how we interpret things. And if we can choose how we interpret a situation it follows that there is another way of feeling about that situation. Everyone has heard the story about the optimist and the pessimist. When the pessimist looks at the glass of water he sees it as half empty. When the optimist looks at the same glass of water she sees it as half-full. The story illustrates the biases that people have which lead them to interpret situations in different ways. Sarah wins a 100m running race. She feels good until she realizes that her time is ten seconds slower than the world record time. Jim drops his fork in a cafe as he eats his lunch. He thinks that every- one is looking at him and feels a complete fool. In fact, nobody had even noticed. Alison fails an exam. She thinks “Oh well, it’s an opportunity to do better next time”. If we are having a hard time at work we might compare ourselves to other people and make sweeping statements like “I’m such a failure”. It might be true that we are not performing at our best, but such a broad label as “I’m a failure” does us a disservice. Perhaps we are neglecting to consider other important areas of our lives, like the fact that we’re providing for three children and caring for a sick partner (“I’m managing well in a difficult situation”). By learning to choose the comparisons we make we can influence our state of mind. All of these statements can be ‘true’, and yet they each interpret the facts in a different light. OK, so interpretations matter, but will it help me? That’s a fair question, but first ask yourself: “Have I ever changed my mind about something?” If you have, then there’s a good chance that you can benefit from CBT. It shows that you’re mentally flexible enough to interpret things differently. One way that we change our minds is by learning something new. Sarah was angry when Michael didn’t come to her birthday party. She thought it was a deliberate snub. When she learned that Michael had been busy taking his sister to the emergency room she felt guilty for ever having thought badly of him. The new information can help us to overcome our biases and lead to a change in our interpretation of a situation – and to a change in how we feel about it. David had always thought that badly behaved children were the result of lazy parents who were not trying hard enough. He felt frustrated when he was around them. It was not until he had children of his own that he realised what a difficult job it is to raise a family. His views towards other parents softened considerably. This new ‘learning’ might come to us naturally, or we might have to seek it out. One way that CBT helps people to change how they feel is by encouraging them to chal- lenge and question their beliefs and assumptions to see if they can learn anything new, which often this leads to new ways of thinking and feeling. You can think of the stance that CBT takes as one that says “What do you think you know, and why do you think you know it?”3 and which gently challenges us to test our assumptions. If you have ever changed your mind about something then you already know first-hand what powerful effects this can have. Overcoming our biases and interpreting situations differently might not happen overnight, but a good way to start is to practise the skill of perspective-taking: trying to see a situation from another point of view. The more mentally flexible we become the more easily we will be able to ‘weather the storms’ of life. Some newer forms of therapy that come within the cognitive behavioral ‘family’ of therapies make such cognitive flexibility an explicit goal. The Perspective-Taking worksheet guides you through some steps helpful to develop your skills in perspective-taking. There is a worked example to give you an idea of how one person broadened their perspective. As an experiment, try carrying some spare copies around with you and completing them when you en- counter situations that bother you. Notice what kinds of answers appear. Don’t worry about getting it ‘right’ – treat it as an experiment and just notice what happens when you try to look at difficulties from different points of view. The next chapter will help you put it all together and look at problems the CBT way. Kahneman, D., & Egan, P. (2011). Thinking, fast and slow (Vol. 1). New York: Farrar, Straus and Giroux. Padesky, C. A. (1990). Schema as self-prejudice. International Cognitive Therapy Newsletter, 6(1), 6-7.